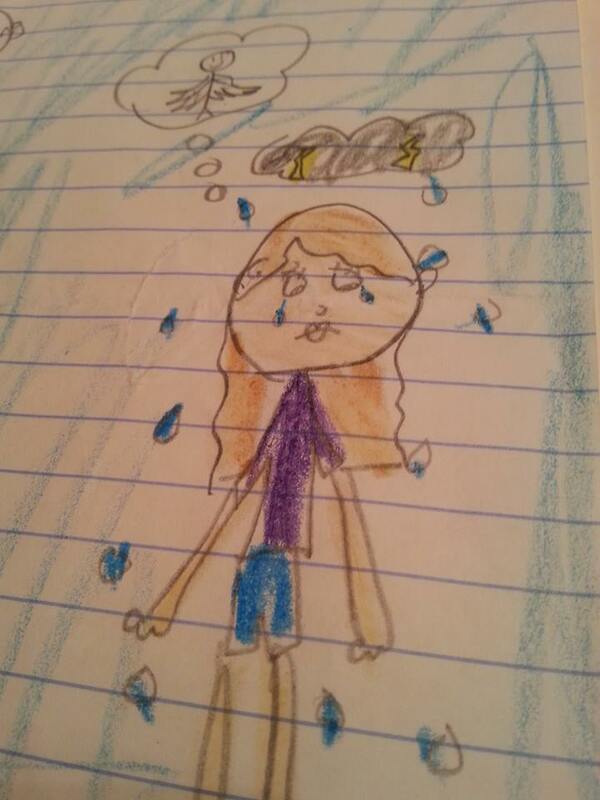 We put out a call to action last week encouraging all of you out there, adults and kids alike, to write a letter to grief in honor of Children’s Grief Awareness Day. When the letters didn’t come rolling in we decided the concept of a ‘letter’ may feel like a little much. I mean, it is 2015, my mom is lucky if she gets more than 140 characters from me at a time. So we put out an update letting you know it could be a note, comment, drawing, tweet, whatever. As promised, we are posting some of the responses we received. Sad that you forgot to reply? 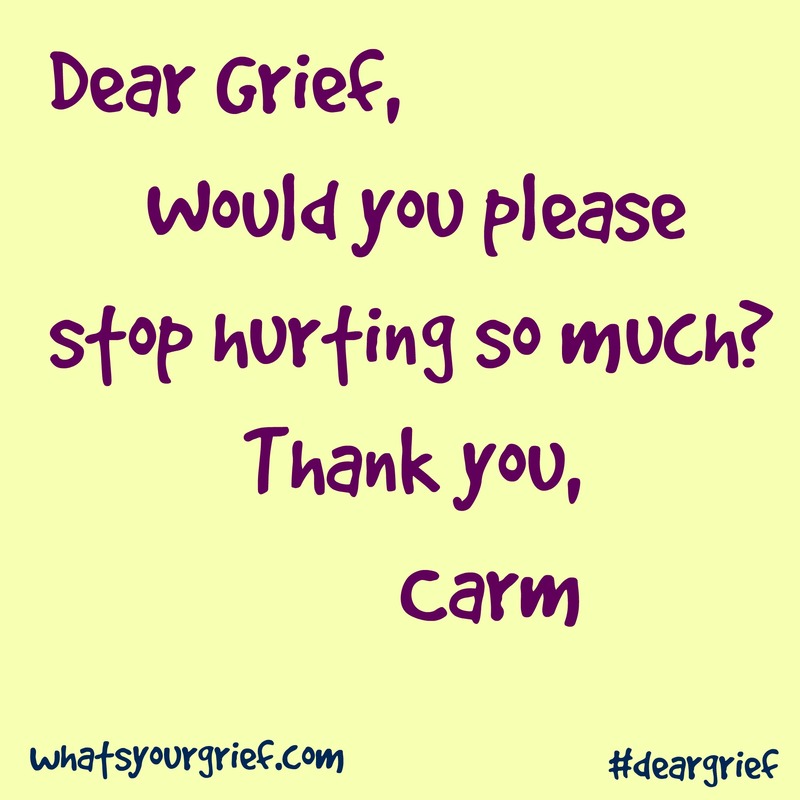 Fear not, you can leave your note to grief in the comments! 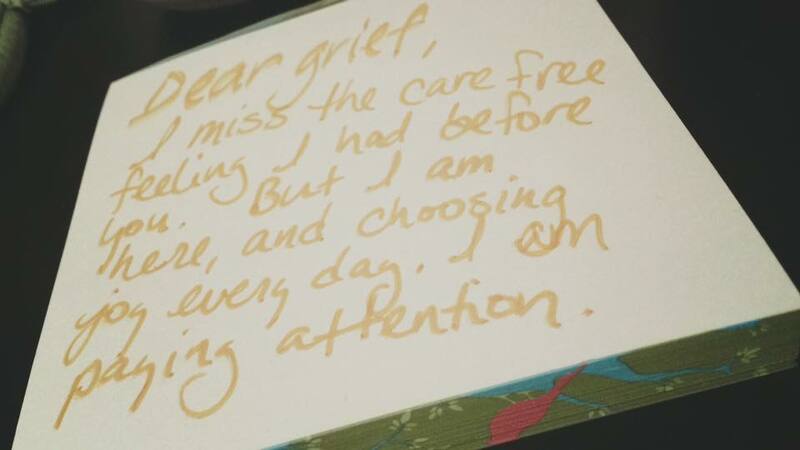 Or, you know the social media drill: tweet it at us and use the hashtag #deargrief OR put it on facebook and tag us OR post it on instagram using the hashtag #deargrief and tag us. Not a writer? Blue is the color of Children’s Grief Awareness Day, so you can also post your blue themed photos on facebook, twitter or instagram with the hashtag #blue4you and #blue4kids. We will update this post with new submissions. 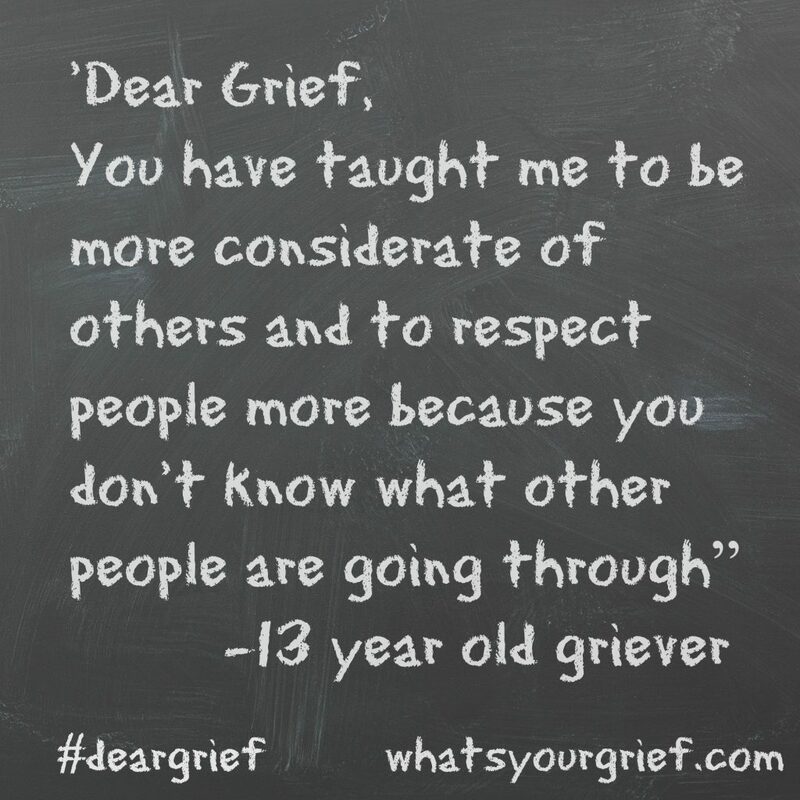 You know you have something to say to grief! Leave your message in the comments! 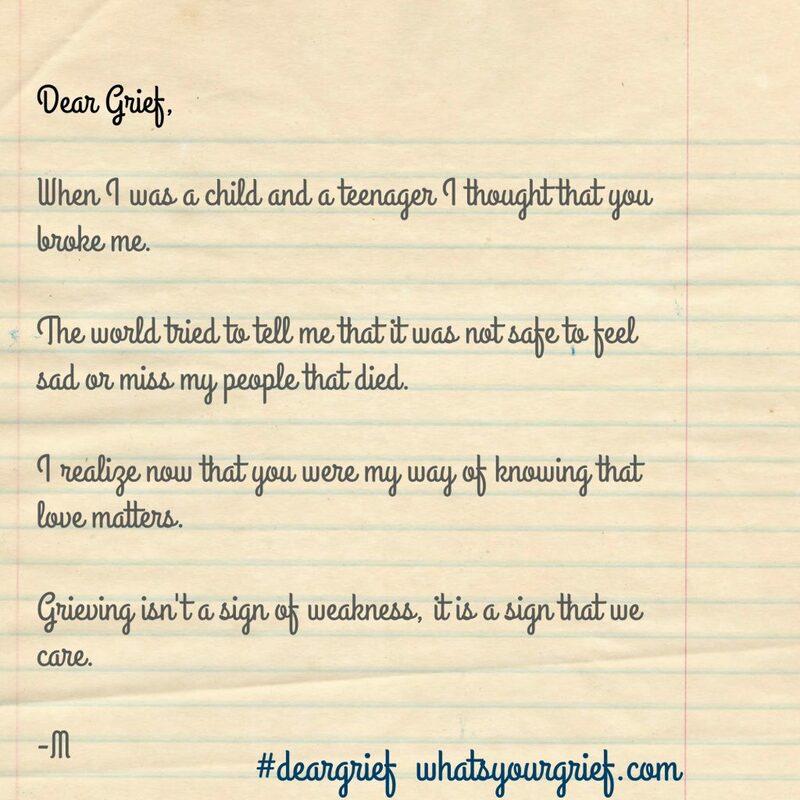 25 responses on "Dear Grief"
I am going easy on you today… you are one of the most powerful forces i have ever felt. Surely you must be leading me some place worthwhile. Dear Grief, You are the enemy that has moved into my heart. You are the reminder that my son has been stolen from me. Before you became a permenant presence I didn’t have to work so hard at life. Now that you have wormed your way into my soul I will keep my eyes open and watch you closely. I will make sure you don’t stop me from being kind, or patient or generous. I’ll use your constant presence as a reminder that I can continue to love deeply. You make me cry grief but I will appreciate those tears as an expression of the love I have for my son. I hate you grief but I will welcome you to stay forever. My love resides with you. I want you to go away because I want to be normal again, but I want you to stay because when you are near, so is he. And I miss him. I liked your idea. It just took me a while to work out what to write. 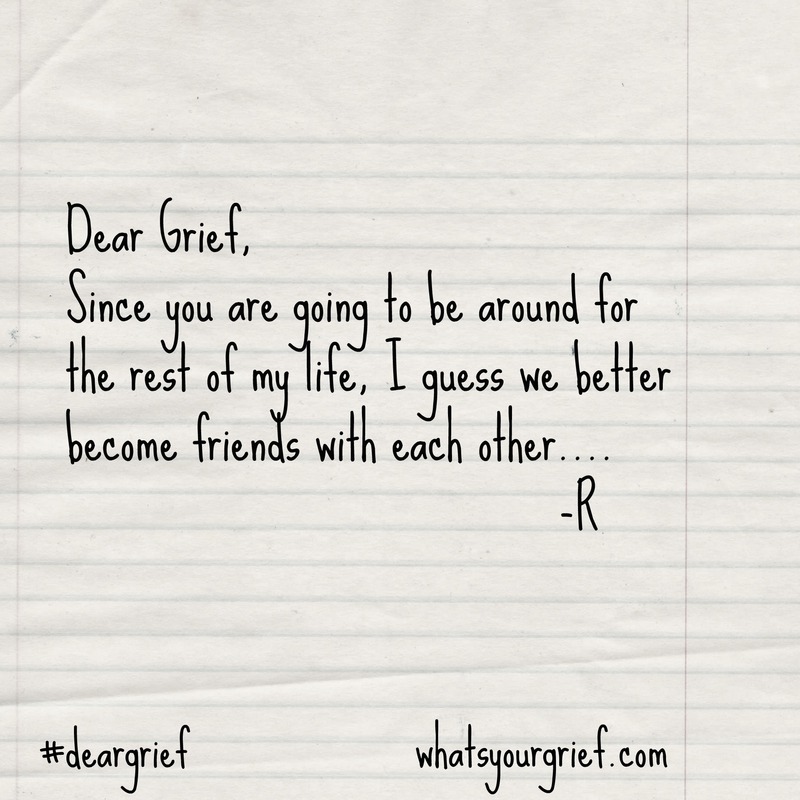 In fact, you inspired me to write into the letters page of a magazine with a “Dear Grief” letter. I thought I could help him, but drugs were stronger than me. Frantically I pushed those chest compressions. Fruitlessly, I breathed his last breath. What his last breath released into me was grief. Agonizing grief. Bottomless. Like a pendulum I grief, some moments it feels gone, then it hits me with the full force of swing of emotions pendulum. I try to will that pendulum to calm and be still, so I can experience only good grief. The swirling thoughts in my mind activate that emotional swing and I am hit again by his thoughts, his smell, his ideas, his frantic last hour of life. Balancing that phone with the EMTs, breathing for Mike, pumping his heart, crying, begging, shaking. I hate grief. My heart is broke, the tears won’t stop, my head hurts constantly trying to remember and forget everything. I am more grateful for what I have now. The world looks different now that I met you. It’s not all bad but hurts like nothing I can describe. I’m constantly angry at you. Joy is hard to find right now. Give me time. Things will change like they always do. You made me feel alone. I like the rain now and gloomy days. I like the sky on pretty days. You make me feel crazy because one minute I appreciate things and the next I do not. Trying to find myself again is a struggle since you came in my life. Waiting still for the storm to pass. I hate you. My daughter, Laura is gone and I have you as my constant companion. I hate you. Even when I smile, or have a bit of fun, you are right there pulling me down. I hate you. I see that others are able to get rid of you somewhat, and live again. From that I get some hope. But as I reach 5 months with out my dear daughter I find you are still around me way too much. I hate you. I am grateful for this website and all of those who share their heart-broken thoughts, but I still hate you. I knew death of relatives as a child, but somehow I didn’t feel grief. Somehow I just accepted the news and moved on. (Sounds a little bit cold-hearted written down like that). But now I know grief. It feels like it hits me hard because I loved my dad so much. All good things come to an end. 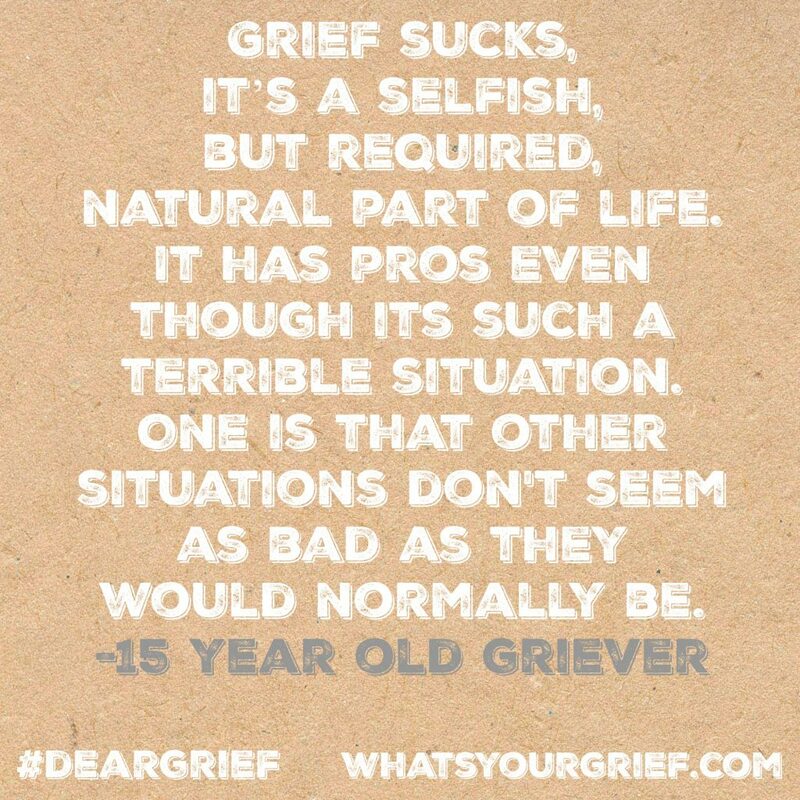 Grief is a necessity. Please allow my family to be able to share the joy of the holidays we had in years past. May we strive to make new memories & be thankful for the old ones we have to hold on to. My faith in the Lord and those who really know and care about me will always be my stepping stones to give me hope and peace thru the low valleys. I know our lives can’t always be sunny days…so looks like we will be lifelong friends. Like any tumultuous relationship, you’ve dragged me through pain and anger and some self-destruction. You’ve shown me my worst self…and my best new self. You’ve freed me to remember how little everything except a few things actually matter. Thanks friend. I still struggle with you every day even after almost 8 years. I have done my best to deal with you, but it is very hard. I know you will be with me the rest of my life and I am learning daily how to cope and not let you get the best of me. 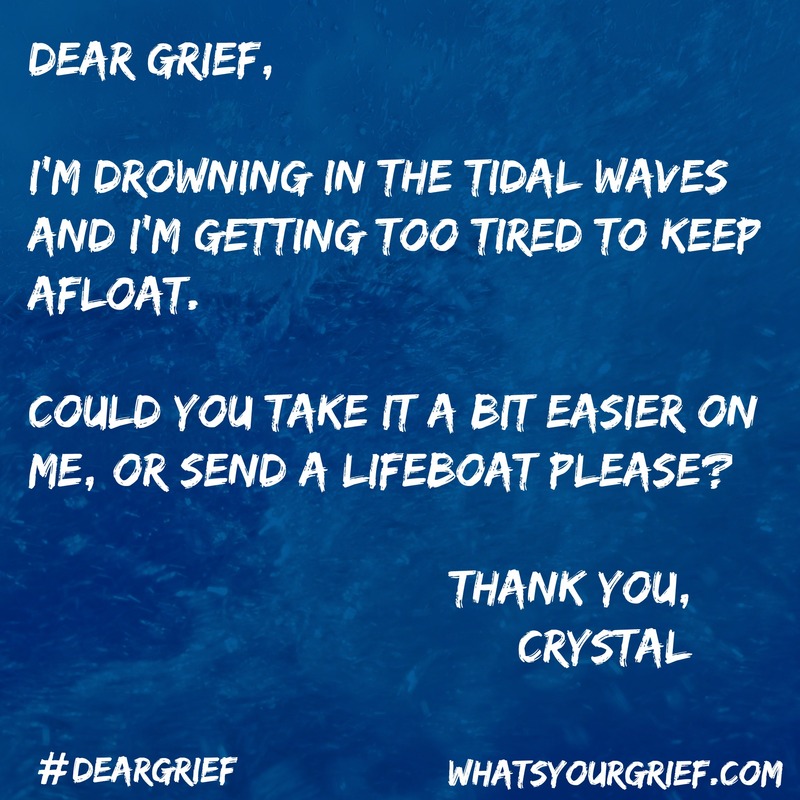 I thoroughly find much help in reading other people’s thoughts on grief. I have also found much support in the website/FB. My old friend. My all to constant companion. You know why I cry. You even know why I laugh. You are always near but I really appreciate it when you back off and give me some time to breath. Time to enjoy without feeling guilty. So I got a new Kitty recently. His name is Mijo. He returned a smile to my face and laughter to my heart. you would like him. Let’s keep our relationship real and not go overboard with each other. Can we do that? I will allow you in when you are needed but I really must insist that you only appear when absolutley necessary. Deal? I am tired of you but at the same time I don’t want to let you go. I wonder how long you will stay. I marvel at how you have changed me. I long for the person I was before you came into my life and yet I appreciate who I have become since you came into my life. I am so grateful that there’s Someone that’s always with me Who is greater than you are. At first, I wanted to give in to you, and I felt so hopeless and helpless. But, now, The One Who is stronger than you is helping me to hope again and to be stronger. 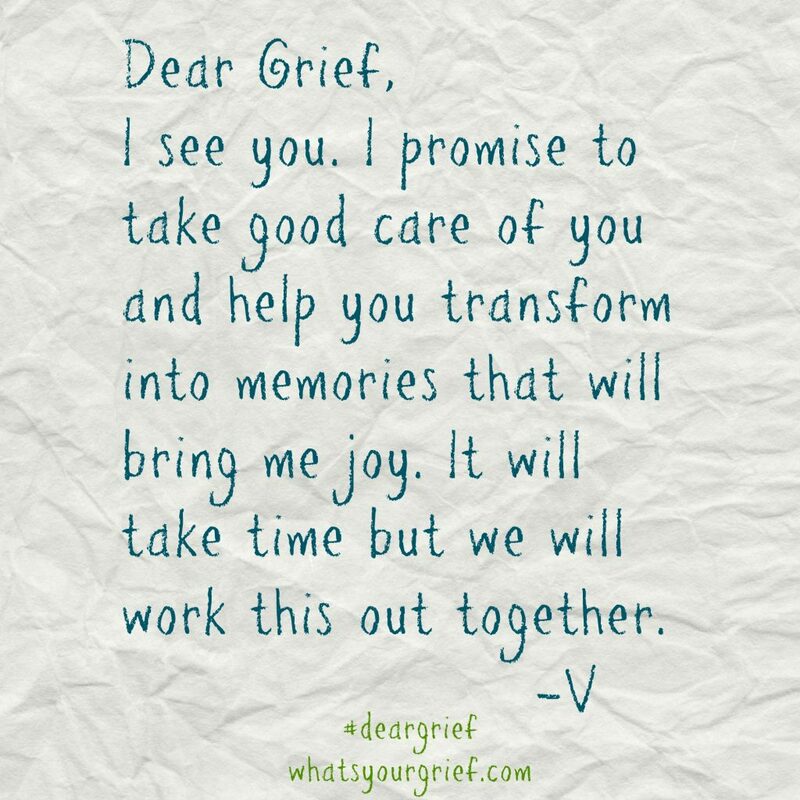 Goodbye grief. I am going to open myself up to all it is you have to teach me. You will not ruin me, you will make me a better version of myself. That’s what my son Christipher would’ve wanted. Thank you grief for allowing me to honour my late husband through the tears you provided. My dearest Jeff is looking down at me with loving compassion!